The Service Trades Council Union, a six-union coalition representing 38,000 Disney World workers, says what The Walt Disney Co. is doing is illegal. But the company has since added a caveat for some employees: that the unions in the midst of contract negotiations must approve and ratify the company's latest contract offer before the represented workers can see their bonus. "I've seen the company do things that I think [are] wrong in the past. 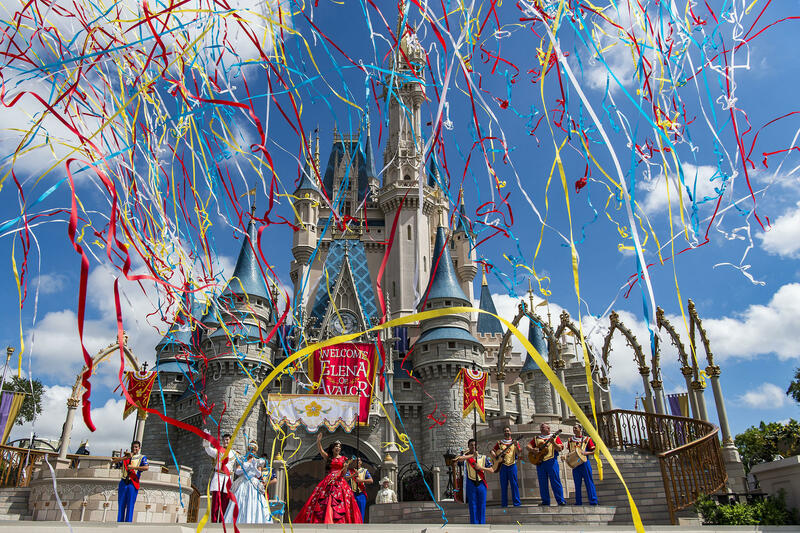 I've never seen them do something this outrageous," says Eric Clinton, a veteran Disney World cast member in Orlando and president of the Unite Here Local 362. The Service Trades Council Union, a six-union coalition representing 38,000 Disney World workers, says what the company is doing is also illegal. On Monday, the group filed a complaint with the National Labor Relations Board. "Wages and bonuses are part of our negotiation process," Andrea Finger, a Disney spokeswoman, said in a statement. "We will continue to meet with the union to move toward a ratified agreement." Disney's bonus announcement came just as the unions were restarting contract negotiations. In December, 93 percent of union members rejected the theme park's offer of a $200 signing bonus and a $1-an-hour raise over two years. Ed Chambers, that union coalition's president, said by tying the bonus to contract negotiations only for those union members, Disney is engaging in a kind of extortion. "We are taking a position at the council [that] they're two separate things: Give us the $1,000 bonus like everybody else; continue to bargain the contract," he says. Madeline Johnson, a ride operator at Disney's Animal Kingdom, says from the moment the bonus was announced, she worried the company would try to use it as leverage over workers. Johnson voted against Disney's most recent offer and says the company is retaliating against workers who voted "no." "I just feel like I'm trying to be bribed and I feel discriminated against, because I don't think it's right that we have to go through this and be blackmailed into accepting something," she says. Johnson says she wants to hold out for a bigger raise, which she says is worth far more to her than a one-time bonus. Not everyone agrees it's worth holding out. Maria Cornell, who works in a Disney store, says she had plans for her bonus. "As a matter of fact, I was going to buy my new glasses," she says, but now those plans are on hold, because both the bonus and the contract remain in limbo. Cornell says she thinks workers have little leverage to negotiate any more than what Disney's offering, and she wants to see a contract ratified. "I just want to get it over with," she says. When Congress passed a sweeping tax overhaul last December, it lowered the corporate tax rate, and dozens of companies promised to share the good fortune with employees. The Walt Disney Company was among them, offering its workers a thousand-dollar bonus. But as NPR's Yuki Noguchi reports, it turns out for many workers, there are conditions. YUKI NOGUCHI, BYLINE: Shortly after the Republican bill passed, Disney promised $1,000 bonuses to all non-management employees. But this month, Disney added a requirement that unions approve and ratify the company's latest contract offer before workers see their bonus. Eric Clinton is a veteran Disney World cast member in Orlando and president of the Unite Here Local 362 union. ERIC CLINTON: I've seen the company do things that I think is wrong in the past. I've never seen them do something this outrageous. NOGUCHI: The Service Trades Council Union, a six-union coalition representing 38,000 Disney World workers, says the company is playing an illegal game of hardball. On Monday, the group filed a complaint with the National Labor Relations Board. Ed Chambers is that union coalition's president. ED CHAMBERS: We are taking the position as a council they're two separate things. Give us the thousand-dollar bonus like everybody else. Continue to bargain a contract. NOGUCHI: In December, an overwhelming majority of union members rejected the theme park's latest offer of a $200 signing bonus and a $1-an-hour raise over two years. Madeline Johnson voted against that deal. She's a ride operator at Disney's Animal Kingdom and says the company is retaliating against workers who voted no. MADELINE JOHNSON: I just feel like I'm trying to be bribed, and I feel discriminated against because I don't think it's right that we have to go through this and be blackmailed into accepting something. NOGUCHI: Johnson says she wants to hold out for a bigger raise, which she says is worth far more to her than a one-time bonus. Disney did not respond to requests seeking comment. Maria Cornell, who works in a Disney Store, says she had plans for her bonus. MARIA CORNELL: We were very excited for getting it. As a matter of fact, I was going to buy my new glasses. NOGUCHI: Those plans are now on hold because both her bonus and the contract that her union voted to reject remain in limbo. She wants to see Disney's latest offer ratified. CORNELL: I just want to get it over with. NOGUCHI: Earlier this month, Disney reported a $1.6 billion one-time gain during its fiscal first quarter largely because its tax rate was slashed. Yuki Noguchi, NPR News, Washington.